I love ornamental onions. I love that they come in so many different sizes and colors. I love that even after their flowers fade most of them hold their shape, making beautiful decorations. 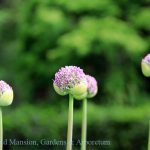 Right around Memorial Day the ornamental onions really begin to shine. This past fall we planted more varieties so as to show off this stunning family of plants. 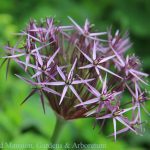 Here are some of the ornamental onions (or Alliums, as they are known in the horticultural world) you will see in the gardens at Blithewold. 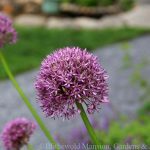 Allium schubertii is a fan favorite. 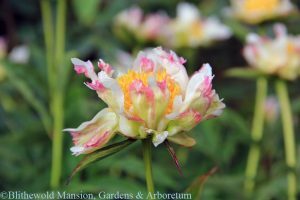 This beauty has substantial size and presence in the garden for being short in stature. It stands only about a foot tall, but the flower expands out to a whopping 12-18″. 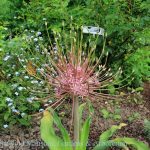 We are often asked about this incredible allium and I can understand why. 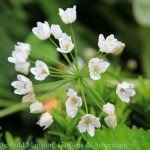 Incidentally, it is also my favorite seed head to bring indoors after it has gone by – the dried flower can last for years! Check out the featured image at the top to see a close up of this crazy bloom. 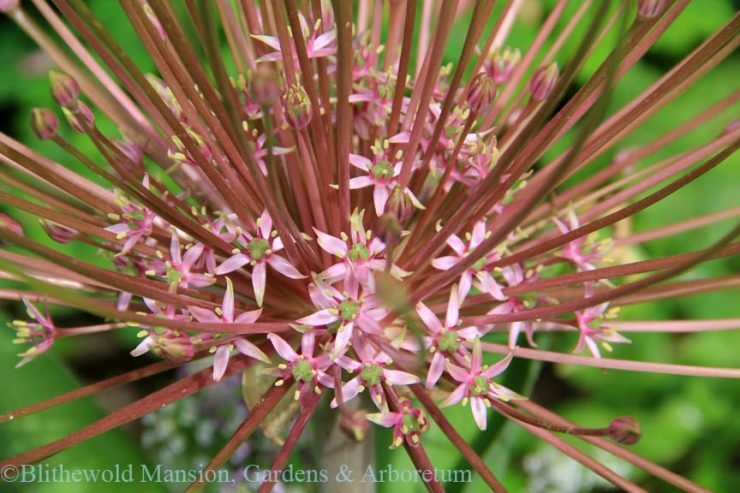 Allium cowanii (commonly known as white garlic) and Allium nigrum ‘Pink Jewel’ are new to the gardens this year. A. cowanii is almost finished blooming, but you may still catch it in flower inside the North Garden entrance. I love how gentle it is for an ornamental onion. The flowers seem to float on the breeze that comes in off the bay. 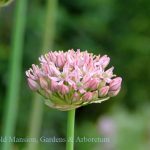 So many Allium are prized for their firm shape and structure in the garden. A. cowanii is a softer, friendlier sort. It is a welcome addition. A. nigrum ‘Pink Jewel’ is just starting to bloom in the Rose Garden near the Moongate. It has a wonderful tall presence and pretty pearl pink color. Pink is a theme for us in the Rose Garden this year. I never thought I would embrace pink with such passion (especially after the disastrous bright pink room I had in my tween years), but I have slowly been building a love for this color. I hope you enjoy it too! 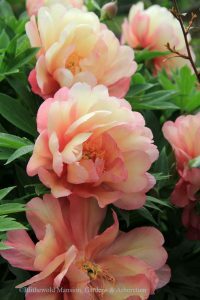 Itoh (or intersectional) peonies are named after the Dr. Toichi Itoh, a Japanese horticulturist who had the brilliance of mind to cross herbaceous and tree peonies. His success is our gain. 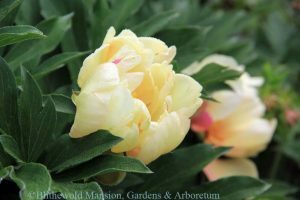 There are five different Itoh peonies currently blooming in the Rose Garden (not pictured, P. ‘Singing in the Rain’). 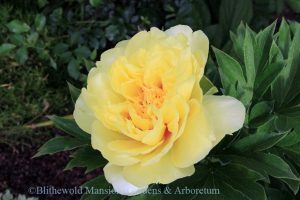 Our intern this summer coincidentally shares a name with the Peony ‘Julia Rose’. I hope to grab a picture with her and her namesake bloom. I often find the end of May/beginning of June to be one of the most beautiful and exhausting times of year. The weather is still mostly perfect (the humidity is starting to creep in on some of the hotter days), the gardens are full of color, and we are planting more plants every day. If you have visited recently, chances are you have seen us in one of the gardens with shovels in hand and plants ready to go in the ground. It is all part of our effort to plan ahead and keep the gardens looking interesting and beautiful and balanced from April through to October. All the tulips from a few weeks ago have been dug up to be stored in our cellar. In their place we are planting dahlias and a mix of perennials and annuals. It is on these days when I am feeling a little burnt out that I am grateful for the vast beauty that surrounds me here. What a pleasure to work somewhere that is also a source of renewal. Right now I am finding rest for my soul in the fragrance that floats in the air. Lilac ‘Miss Kim’ in the Rose Garden is a beautiful late season lilac. It also smells wonderful! 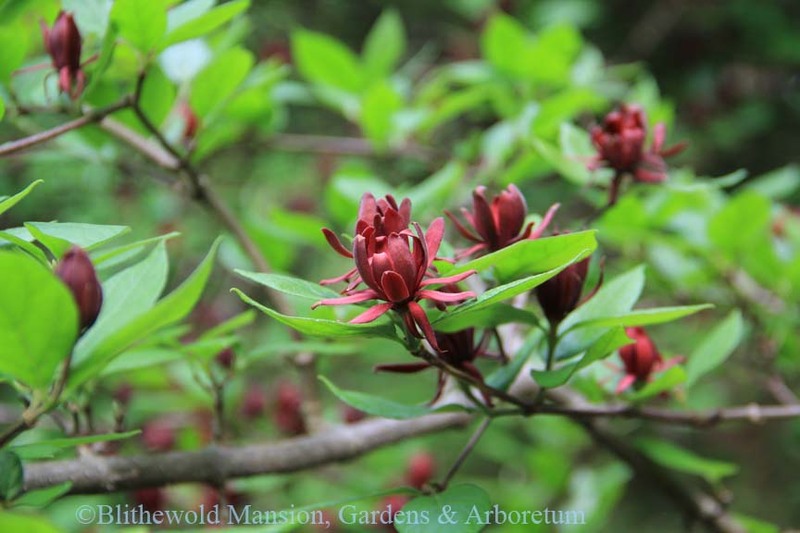 I have also been immensely enjoying the Carolina Allspice (Calycanthus floridus). You can find our Carolina Allspice in the Enclosed Garden near some of my other favorites, the Katsuras (Cercidiphyllum japonicum). I hesitate to describe the fragrance because I would love to hear your own descriptions. 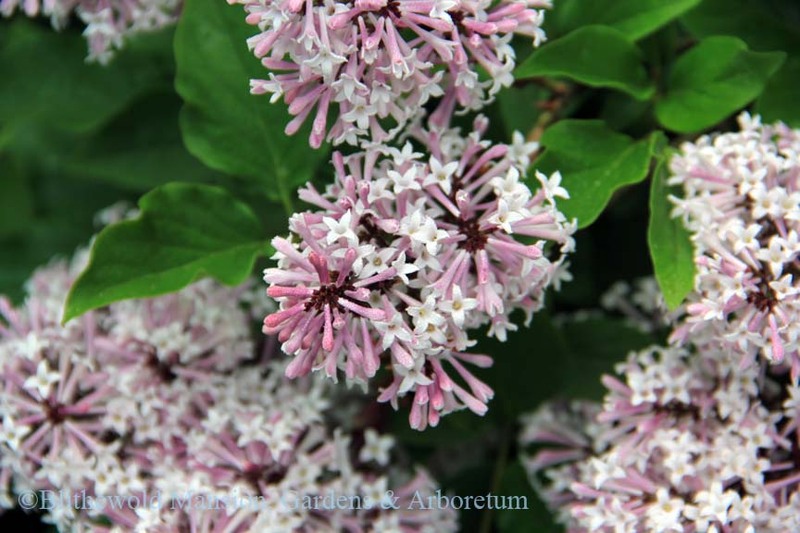 Stop and take a sweet breath near this shrub next time you are here. There is so much more to say and so much going on in the gardens, but I will hold off on that for now. Instead, I will end with our venerable Chestnut Rose (Rosa roxburghii). Gail always says this is the first rose to bloom and usually right around June 1st. She is right once again. Here it is! Soon the whole tree will be covered in these pink blooms. It is truly a sight to behold. 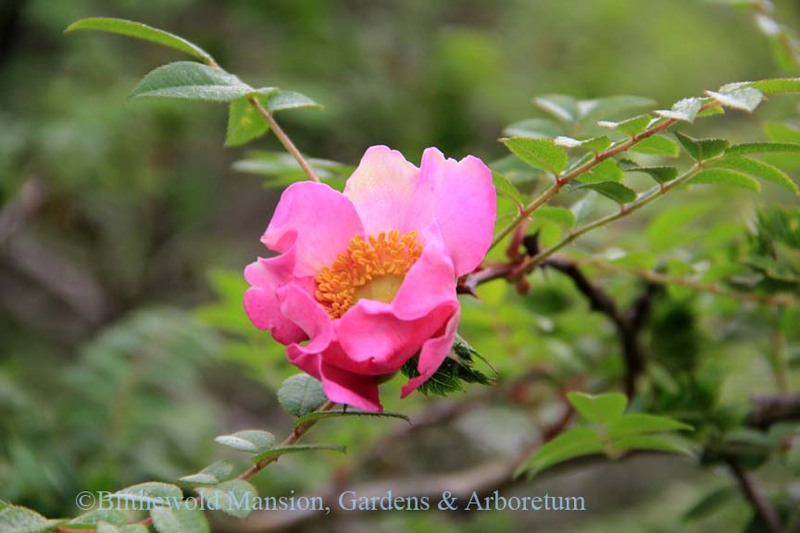 The Chestnut Rose has been here at Blithewold for an estimated 90 years. Next time you need a sweet reminder of resilience come to Blithewold and bask in the beauty that stands the test of time. Spring is in full swing! Hope to see you here soon. Don’t miss out on the chance to see the gardens at one of their prettiest times.